In a stunning twist, News24 can report that Agrizzi will name De Wee as a recipient of cash payments relating to a 2008 tender awarded to Bosasa subsidiary, Sondolo IT, by the Department of Justice and Constitutional Development (DOJ) for the installation of security systems at courts around the country. News24 emailed detailed questions to the commission and followed up with phone calls and text messages to obtain comment, but at the time of writing, no response had been forthcoming. This article will be updated as soon as a response is received. 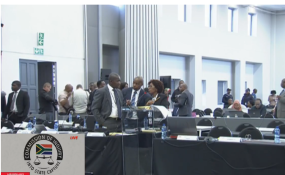 De Wee, who now holds a crucial position at the Zondo commission, was allegedly paid an undisclosed amount of cash monthly by Bosasa, via politically connected middleman, Sesinyi Seopela. News24 has asked the Commission whether it agrees that De Wee poses a threat to Agrizzi's safety. De Wee was allegedly among the officials who would then in turn receive the cash from Seopela. Sondolo IT/GTS was one of six companies to be awarded a part of the massive R1-billion security contract, but was the only company to be awarded work in all nine provinces. De Wee was not immediately available to comment when contacted on Thursday evening. News24 attempted to reach him again on Friday morning. Seopela answered his phone on Friday morning, but shortly after hearing he was speaking to a journalist, cut the call. "I am walking to the gym, call me in the afternoon," Seopela said. He read a subsequent WhatsApp text message, but did not respond. In July last year, News24 reported that a R10-million contract was awarded to Sondolo IT/GTS to provide CCTV, access control and physical guarding services at the temporary offices occupied by the Zondo Commission's staff. The contract was awarded by the DOJ. Minutes of meetings between various suppliers to the commission revealed Sondolo IT/GTS was "nominated" for the job. Sondolo IT/GTS was supposed to also provide physical guarding the entrance of the venue for the public hearings at the Hill on Empire building in Parktown. The South African Police Service then took over the physical security aspect, however it is not clear whether access control and CCTV systems Bosasa was destined to install were in fact installed, or removed subsequent to News24 reports on the deal.